The criminal courts charge should be scrapped by ministers, a parliamentary committee has said, as it raised "grave misgivings" about the fee's benefits. Since April, convicted criminals in England and Wales have had to pay a charge of between £150 and £1,200 towards the cost of their case. MPs on the justice select committee said the charge, which is not means-tested, created "serious problems" and was often "grossly disproportionate". Ministers said it was under review. The fee is paid on top of fines, compensation orders and defendants' own legal charges, and is higher for those convicted after pleading not guilty. It is set according to the type of case, with the minimum charge for magistrates' courts and the maximum level for crown court cases. In March, the then Justice Secretary Chris Grayling said the fee would ensure that criminals "pay their way". But chairman of the cross-party committee Bob Neill said: "The evidence we have received has prompted grave misgivings about the operation of the charge, and whether, as currently framed, it is compatible with the principles of justice." He added that "in many cases it is grossly disproportionate" and created "perverse incentives - not only for defendants to plead guilty but for sentencers to reduce awards of compensation and prosecution costs". The committee's report said the lack of discretion for judges and magistrates on the level of the charge was creating "unacceptable consequences within the criminal justice system". It cited the case of a woman who had admitted stealing a four-pack of Mars Bars worth 75p, saying she "had not eaten in days" after her benefits were sanctioned. She was ordered to pay a £150 criminal courts charge on top of her £73 fine, £85 costs, a £20 victim surcharge and 75p compensation. Image caption The then Justice Secretary Chris Grayling said in March that the charge would ensure criminals "pay their way"
The committee also said it was "highly sceptical" of government claims that the charges could deliver a net revenue of £80m to £160m a year by 2023 - with an annual cost of collection of about £20m and a £5m bill for imprisoning defaulters. 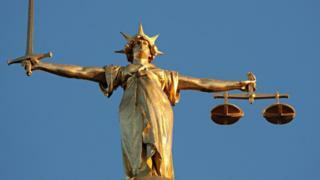 The Ministry of Justice said the concerns were noted and the operation of the fee was being kept under review. It comes after Justice Secretary Michael Gove told Parliament earlier this month that the charge was generating revenue and helping to "ensure that the taxpayer is not the first port of call for supporting the way in which our courts operate". But Frances Crook, chief executive of the Howard League for Penal Reform, said the criminal courts charge was "unrealistic and unjust" and called on the Ministry of Justice to "suspend this policy immediately". "The innocent have been put under pressure to plead guilty, and ordering indigent people to pay money they simply do not have is never going to work," she said.